In a previous post for UKSCBlog, I looked at levels of dissent in the Supreme Court in its first year of operation, and how this compared to levels on dissent on other common law courts of last resort. Now that the court is entering its fourth year, and now that the issue of dissentience on the court has become a matter of public debate, it seems opportune to revisit the issue. 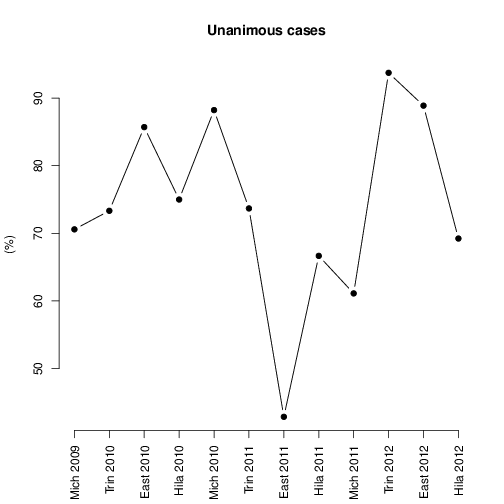 The figure below shows the percentage of judgements each term that were unanimous. The average for the entire period (75%) is slightly lower than the comparable figure reported in my previous post for the House of Lords (82%), suggesting that the Supreme Court is more dissentient than its predecessor. However, there is no evidence to suggest that the Supreme Court has ‘grown into’ its dissentience. Whilst 2011 from Easter Term onwards was fairly disputatious, levels of unanimity bounced back in Trinity 2012 to their highest point. There is, therefore, enough in the statistics to suggest that the perception of the Supreme Court as more dissentient than the House of Lords is correct. It is worth noting, however, that these levels of dissent still make the Supreme Court somewhat more likely to deliver a unanimous judgement than the High Court of Australia or the Canadian Supreme Court. In order to understand better these statistics on the level of dissent, it is helpful to understand the sources of dissent. Which judges are more likely to author dissenting opinions? Based on her dissents in a number of high profile cases, and in particular on the manner of her dissents, and the reception they received from her colleagues, I had expected Baroness Hale to be the most dissentient UKSC judge. Not so. 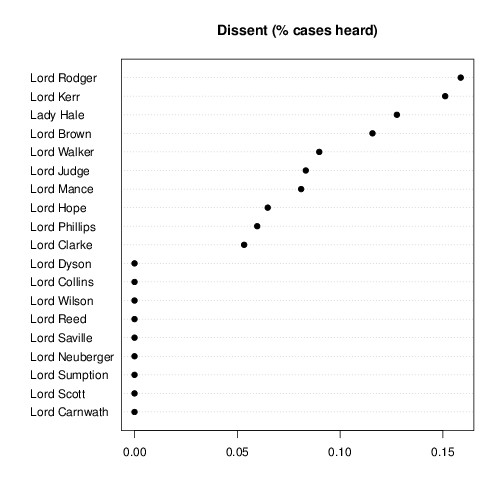 As the graph above shows, Lords Rodger and Kerr have shown the greatest propensity to issue dissenting judgements, doing so in 10/63 and 13/86 cases heard respectively. A large number of these dissents concern Scots and Northern Irish cases. Lord Rodger gave a dissenting opinion in Martin v Her Majesty’s Advocate  UKSC 10; but also on applications for judicial review in certain Northern Irish cases. Lord Kerr dissented in a large number of Scottish cases — not only Martin v Her Majesty’s Advocate, but also Birnie et al v Her Majesty’s Advocate  UKSC 55 and McGowan v B  UKSC 54 — and in R v Gnango  UKSC 59. Thus, to the extent that dissent, by reducing legal certainty and predictability, and causing the opinion of the court shift more obviously with changes in personnel, is a negative development (and I am not sure it is, for many of the reasons given by Matthew Ryder QC) and to the extent that current levels of dissent have these effects, then dissent may be a problem for Scots and Northern Irish law than for (say) family law or public law. The data used to generate these graphs are available online at Google Docs. Please note that these data list each case separately, rather than combining cases dealt with in the same judgement. Should you find any errors in the description of each judge’s opinion (L = Lead; C = Concurring; D = Dissenting; P = Dissenting in part; concurring in part) I would be grateful if you could let me know. Chris Hanretty is Lecturer in Politics at the University of East Anglia. This article was originally posted on his blog. Interesting stuff. Wonder if propensity to dissent (or to agree) might be a function of type of case (commercial/family/criminal etc etc) and judge hearing it i.e. is Lord Saville more or less likely to dissent in an insurance dispute (given his background)? It seems likely too to be a function of the types of cases that reach the SC/HoL – no idea whether there is data on this but my guess is there are more commercial cases than (say) boundary disputes b/w neighbours simply as a product of costs and risk. Common law development depends on a steady stream of cases reaching courts yet if the bulk are those in which one company or two is litigating (as they are the only ones who can afford it) or criminally aided defendants, that produces a skew. Leave a reply on "Dissent in the UKSC, update"